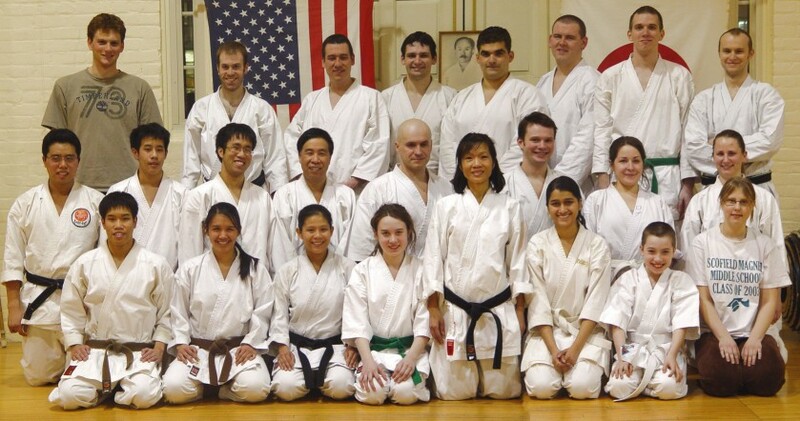 UConn Karate Club class photo, February 27, 2008. Front row: Nick McIntosh, Juvy Abarientos, Florie Vinca, Felicia Tiso, Shree Thatte, Carley Silvia, Jenn Lucatino, Kelly Burgdorf, Susana Ulloa. Second row: ? ?, Brianna Boyce, Devon Conover, Heather Murdock, Mike Jacobs, Aidan Boyce, Cera Ngu, Michelle Rausen, Anh Tu, Vi Ha. Back row: Pawel Wysocki, Mike Silvia, Aurelien Carlier, Brian Boyce, Tony Carpanzano, Ryan Jacobs, Greg Sanderson, Joe Dowden, Jamal Barber, Dan McIennon, Nicole Walsh, Brittany Salvatore, Christine Dufour. Class Photo Friday, February 29, 2008. Front row:Jeremy Bui, Juvy Abarientos, Abby Barrera, Brianna Boyce, Kim Bui, Shree Thatte, Aidan Boyce Anna Kapranova. Second row: San ?, Zach Bui, Tim Bui, Chinh Bui, Rob Terlikowski, Ryan Jacobs, Heather Murdock, Melissa Jacobs. Back row standing: Justin Lieberman, Aurelien Carlier, Brian Boyce, Matt Delude, Tony Carpanzano, Pawel Wysocki, Joe Dowden, Mike Jacobs.